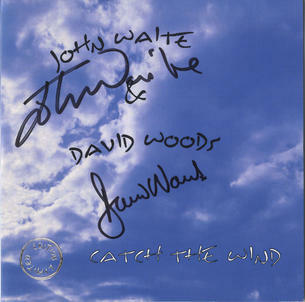 This is a Limited Edition special recording of Donovan's " Catch the Wind " of 250 copies by Rock Legend John Waite and Lancaster musician David Woods. John kindly signed these copies when he visited his hometown of Lancaster recently and both John and David sang a brilliant Live version on Radio Lancashire's John Gillmore Show. In addition to the main track there is a self penned recording by David Woods entitled " Came the rain ".